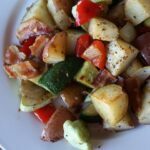 Salty bacon pieces, tender vegetables and roasted potatoes turned out to be an excellent last minute dinner idea. I hadn’t planned tonight’s meal, due to being out of town over the weekend. I was in the mood for bacon, so I decided to start some in the oven and then go from there. It turned out really well. My whole family really liked it. What’s not to like? It’s bacon, bacon and more bacon! While the potatoes and bacon are still in the oven, melt the bacon grease in a skillet. Once your oil is hot, add onion and peppers. Cook that without stirring for a few minutes, allowing it to brown slightly. Add the squash and the garlic and stir infrequently, allowing the squash to brown slightly. Do not overcook any of the vegetables. You want them to be warm, but with just a bit of a crunch remaining. Remove the potatoes from the oven when they are done. 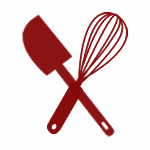 Test them with a fork to determine doneness. 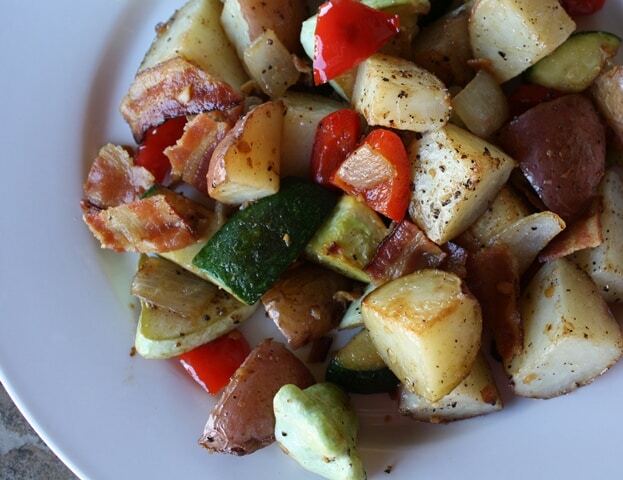 Cut the bacon into 1-2” pieces and add the bacon and the potatoes to the skillet with the vegetables. Top with a fried egg, over easy, if desired. Enjoy! I love to look back! This way I can catch any I may have missed! Lovely recipe.